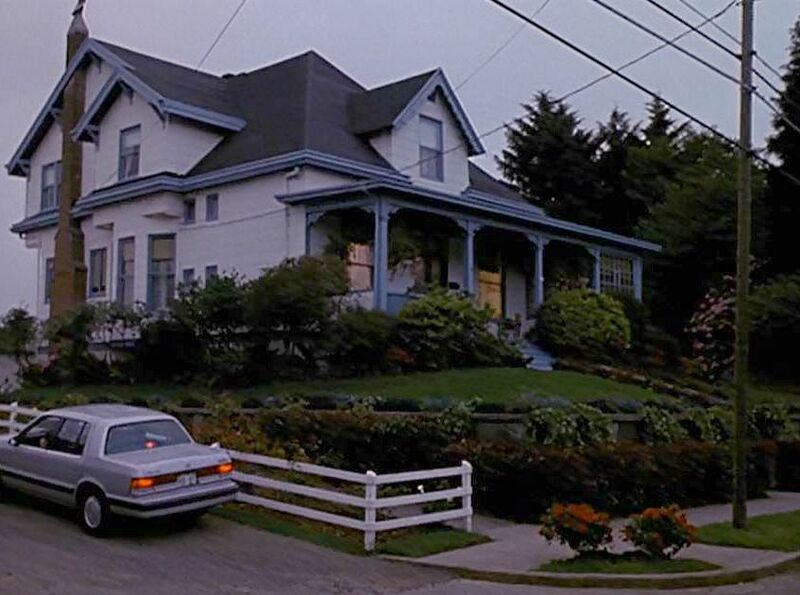 When a reader told me this Victorian house from the movie Kindergarten Cop was on the market in Astoria, Oregon, I had to watch it again to jog my memory. Arnold Schwarzenegger’s love interest, a young teacher named Joyce, lived here with her son Dominic. 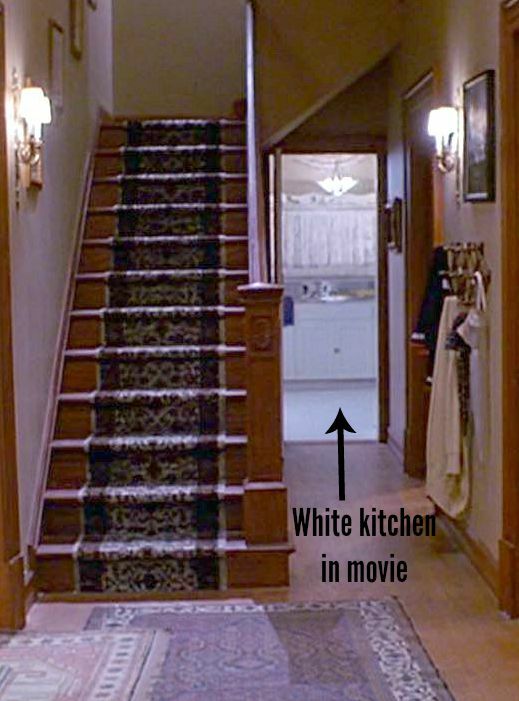 The trim was painted blue in the movie, which came out in 1990. Schwarzenegger played John Kimble, a tough city cop who wants to put bad guy Cullen Crisp — the perfect ’90s villain, ponytail and all — behind bars. The only person who can testify against him is his ex-wife (Penelope Ann Miller), so Kimble goes undercover at the school in Oregon where she teaches. 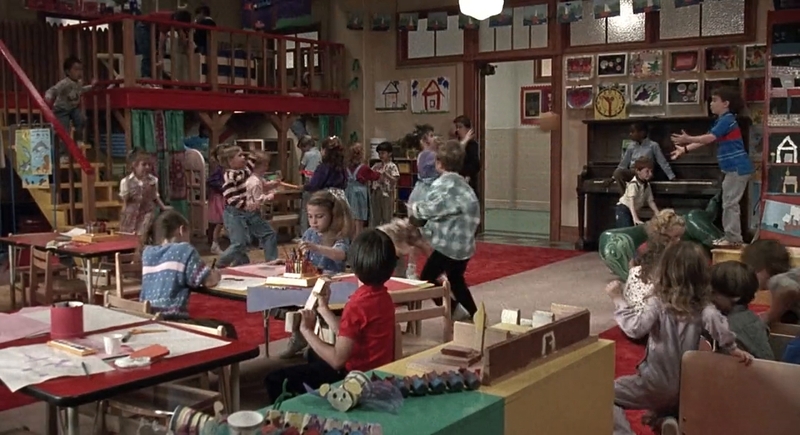 The wood trim and windows in other rooms look the same, however, which makes me think they shot some of it on location. The house was built in 1895 and still has many of the charming original details like the built-in china cabinet. Thank goodness no one ever painted over it! The only thing better than all these big windows? The view on the other side! The sunroom needs work but has so much potential. I’d love to see it all fixed up! 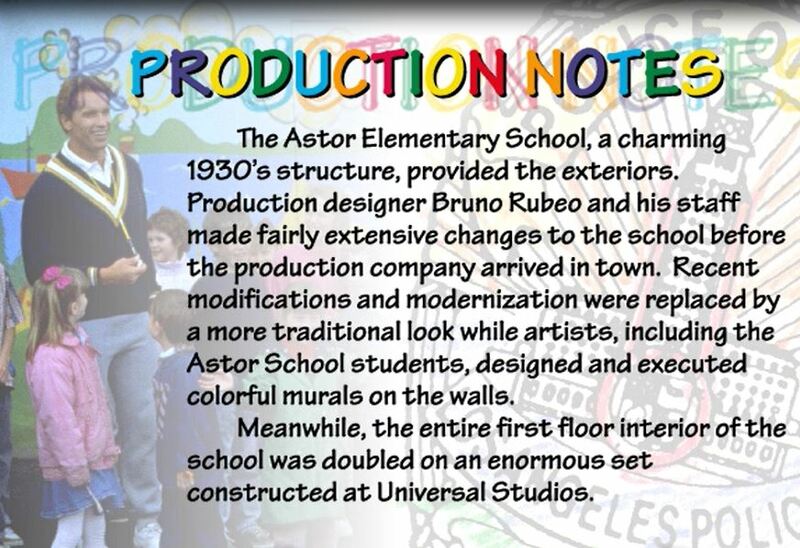 Found it interesting that production designer Bruno Rubeo made the classrooms look more “old school,” so to speak. Thanks to Derek for letting me know that it’s on the market in Astoria, Oregon, for $469,000. Check the listing for all the photos and details. It really hasn’t changed too much in 25 years — on the outside, at least! Such a cool house! 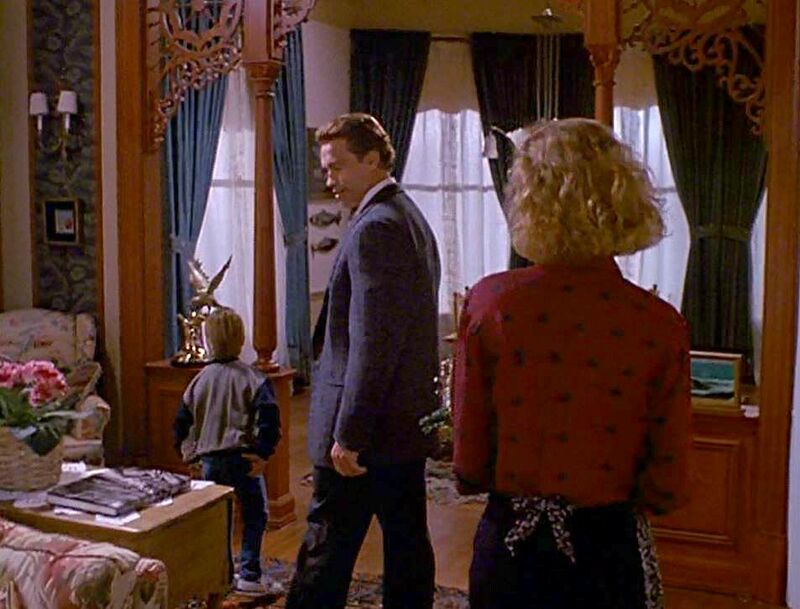 It’s interesting: a lot of the fancy wood details are Victorian, but the bones of the house look very Craftsman-like. I have 1910 Craftsman with the same windows by the fireplace, very similar dormer windows on the second flow, same back door by the kitchen, and the floor plan and flow of the house feels like mine. Also most of the woodwork–aside from the very detailed scrolling pieces– looks more like Craftsman details. Do you think someone added those pieces later on? You’re right, Esther! It’s hard to really categorize this house. Almost like a hybrid of different styles. I’d love to know which parts were original and what was changed over time! I hate to say this, but I have never been so depressed looking at a house. Granted, my own home is still in progress, but I feel like there is such a lack of personality inside and out. This is why I have never been a fan of the whole real estate demand that you need to “stage” your home, i.e. strip away all personal items, so others can see how they could live in it. I rather see the life than emptiness. As an aside, the scroll work and little details indicate just how much potential this house truly has. I hope that the new owners give it lots of love. Wow – talk about potential! I’d love to get my hands on this house! I’d definitely change the interior paint colors (I’m talking to you, weird blue ceiling) and play up that amazing woodwork. I love that sunporch too – gorgeous. And the views are fantastic too. I kind of like the green trim better than the blue, but it looks like some of the window and door trim has been covered by what looks like asbestos shingle siding. I’d love to see what’s under that. Dreamy house! This house has enough of the original bones – architectural style mashup and all – for someone to do a very cool remodel. Astoria is chock full of great old Victorians, Edwardians and Craftsman style houses. 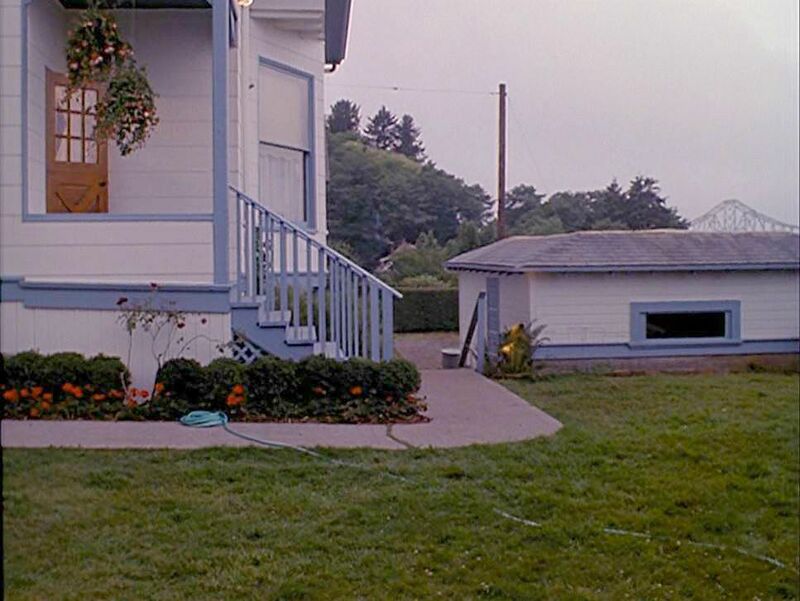 As a side note: the “Goonies” house is not far from this one. That’s right, “Goonies” was filmed in the area, too! Thanks, Matthew. What is it with people painting bedrooms HORRIBLE colors? This house doesn’t look too “staged”. If it was the bedrooms would have decent colors with matching bedding (at least). I think they just ripped out all their clutter. And another 2 cents – if you can’t paint a STRAIGHT LINE – do yourself a favor & don’t pait walls insane colors. Your wiggley lines at the ceiling are very off-putting….sorry -this really seems to be an annoying trend…. Such a cute movie! I can still hear Arnie’s voice…”It’s not a tumor!” 🙂 As other readers have said, such potential, but the decor is, well…horrifying! I too wondered about the mixture of styles. 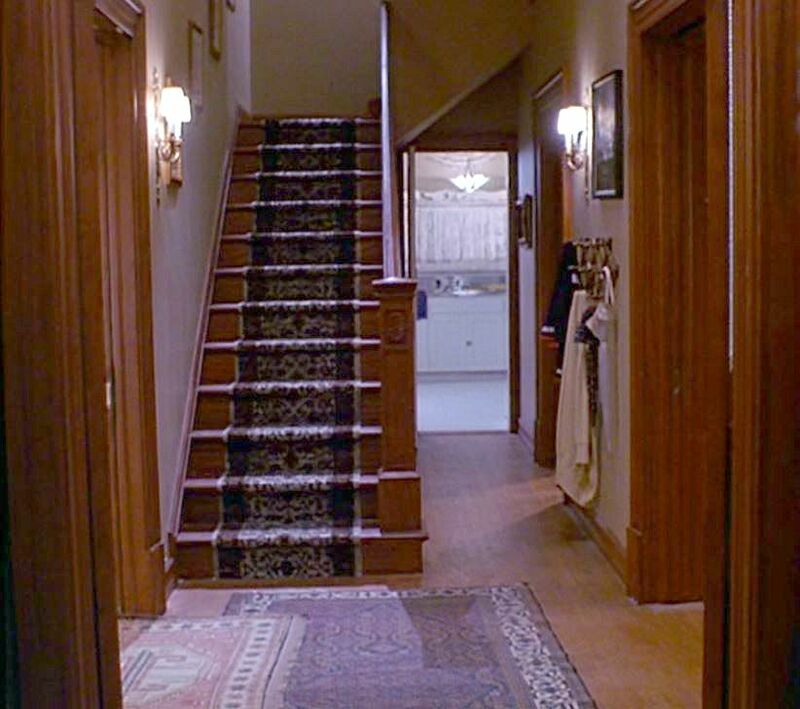 The (real) stairway looks completely craftsman, but all that fancy scrollwork is totally Victorian. The best thing about this one is the view. Great location. This post – this one right up there – is the downside to your otherwise wonderful blog, Julia. I am SICK with desire for this home. SICK. Do you understand me – SICK!!!!! It called to me before I ever (virtually) opened the front door, more persuasively than any other home I’ve ever seen here. I kept thinking “look at that woodwork! Look at the views! Look at the windows! Look at how much space? It will be too expen- “OHMYGODITS UNDER$500GRAND”. You are not my favorite girl today, missy.